The inherent contradiction in Syriza’s vision - insisting both on ending austerity in Greece and staying in the Eurozone - does not signpost a logical impossibility. 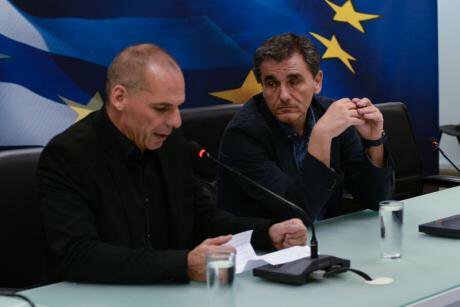 Euclid Tsakalotos takes over as Greek finance minister from Yanis Varoufakis. Demotix/Wassilis Aswestopoulos. All rights reserveDefeat is an important and multivalent aspect of left political thought and praxis: one that involves engaging with the political actuality and potentiality of the ‘always already’ and the ‘not yet’, as well as the fraught interface and very dialectical contradiction between these two temporal registers. This is an account of ‘defeat’ in leftwing politics in the aftermath of the Syriza-led coalition government’s forced capitulation of July 13, 2015. As we mourn the defeat that the left government in Greece suffered at the hands of global finance capitalism, we have yet to make way for reclaiming political thought. As we struggle to process the depression, desperation, and anxiety that follows defeat, we might well consider what ‘defeat’ as a political concept means. Since July 13, 2015, the left is confronted with what Walter Benjamin called the “critical state of the present”, whereby what is brought to crisis is not the status quo, but rather the forces engaging in its subversion; a state in which “the status quo threatens to be preserved”[i]. Against this background, we might ask: what would it mean to think critically of the present as loss or to ask how this loss could become the condition of a new political agency? Furthermore, what has the left succeeded in not only despite but also through its defeat? What have the neoliberal sovereign powers of Europe lost as a result of the Greek left government’s “defeat”? What can we do politically with this defeat, despite its debilitating logic? What spaces of possibility has it already opened up? A declaration of defeat can only take place within a horizon of a certain idealized intelligibility of ‘victory’, with all its heroic and masculine undertones. In opposition to this kind of nostalgic mystification premised upon a narrative of ‘lost causes’ (all too familiar in leftwing melancholia), I am interested in opening the event of the defeat to its own contingencies. This is by no means to repudiate utopian thinking; on the contrary, it opts for a critique that takes power relations, performative im/possibility, and finitude into consideration as forces that are fundamental to the making of the political. To do so is to sound the alert against a reduction of the performative to its agent’s intentionality, whereby the undecidable elements of alterity and power are suppressed. Although the moment since the long night of July 12-13, 2015, when massive pressure was exerted over the Greek prime minister to compel Greece out of the Eurozone or agree on a punitive austerity package, was indeed a moment of defeat for the forces of the European left, it is also true that the European Union is a different place: one marked not only by the surrender of liberal democracy to the forces of neoliberal authoritarianism, but also one pulsating with dissent against the anti-democratic excesses and depredations of those forces. Instead of regarding this defeat as merely a ‘mistake’ to be corrected, and although other strategies should now be devised and developed, the one deployed in the negotiations culminating in the showdown of July 12-13 should not be simply disclaimed or discounted. The inherent contradiction in Syriza’s vision - insisting both on ending austerity in Greece and staying in the Eurozone - does not signpost a logical impossibility, but rather the performative dialectic of an im/possibility, which has worked effectively to push an increasingly divided European order of things to its own limits. Theodor Adorno famously opened his book on negative dialectics by criticizing the idea that the outcome of dialectics will always have to be positive. Against this conceptualization of a preordained affirmative dialectic, Adorno sought to theorize dialectics as an open rather than a closed process. Beside Adorno, Walter Benjamin’s heretical, non-teleological historical materialism also places an unyielding insistence on the unpredictable openness of history. Contemporary critical thinkers such as Judith Butler (for whom performative contradiction is crucial to radical democracy)[ii] and Catherine Malabou (with her notion of plasticity)[iii] have sought to account for a dialectic that refuses totalization in the form of desire for closure, or wholeness. It is this account of dialectics, which we need to bring to bear on this discussion of Greek ‘defeat’ and its aftermath. A non-teleological mode of dialectics, open to history, is also open to differential chains of political signification, actuality, and potentiality. By any account, this is a devastating moment for reflection and self-reflection; an ongoing recognition of our limits against power and for acknowledging the sheer and urgent necessity of addressing the tortuous complexity of the predicament in which we currently find ourselves. The affirmative ‘No’ result of the referendum of July 5 figured a break with the logics and logistics of austerity and authoritarianism in Europe. It also created an opening to the performative potential of a plural democracy. The events ensuing this resounding ‘No’, which Syriza had advocated, exposed the appalling extent to which corporate capitalism has taken precedence over democratic agonism. Eager to confirm that “there is no alternative” to neoliberal doctrine, the European leadership sought to defeat and humiliate the Greek government, the first left-wing government ever elected in a EU member state, by forcing it to comply with the axioms of neoliberal governmentality. Faced either by capitulation or a disastrous rupture, the government was eventually forced to accept under duress a tormenting and punitive deal; an austerity package that the left government could not accept but also could not refuse under these circumstances, without jeopardizing its own political identity and survival, and, even worse, without failing the trust and expectations of the people it represents. When the EU functionaries rushed to claim that the referendum ‘No’ was aimed at an exit from the euro, the Greek government reaffirmed that the mandate of the ‘No’ was to refuse austerity measures without leaving the Eurozone: a political interpretation resonant with Syriza’s unwavering programmatic commitment to a struggle for a European alternative to the present neoliberal status quo; and for a Greece within a Europe of social justice and democracy. It was this performative ‘contradiction’, which allowed Syriza to set the agenda not around the euro itself but rather around the vision of a democratic and socially just Europe and European Union, that was so irritating to the EU post-democratic, monetarist orthodoxy, which is precisely why the guiding principle of the (non-elected) ‘institutions’ (the Eurogroup, ECB, IMF, and European Commission) during that latest phase of the ‘negotiations’ was determined to bring about Syriza’s capitulation and/or political destruction, including its removal from office. Their aim was to establish the doxa that there is no place in Europe for an anti-austerity, anti-neoliberal democratic left, and certainly not for the left in government. The left must resign itself (again) to the role of opposition. Their main strategy was the paradigmatic defeat of parties on the left, especially those with governmental claims by means of what Costas Douzinas has so aptly called “a very European coup”. [iv] The punitive thrust of the forced (albeit economically and politically unenforceable) “agreement” was made manifest in so far as it required the Greek government to revoke all the measures that it took after rising to power in an attempt to alleviate the suffering of the working classes and those most harshly afflicted by the crisis. The creditors succeeded in extending the bailout cycle: they provided a new loan that required the dispossession of public resources and the indebted citizens’ properties to pay back its debt. No one can ever fully grasp the existing balance of power. But Syriza’s strategy – to refuse neoliberal politics without leaving the Eurozone - was defeated partly because it had undervalued the existing balance of power in the European structure. Syriza was not prepared against the eventuality of Schäuble’s proposal to force Greece out. It has been credibly indicated by various commentators that, given the collapse of public finances and social welfare services in Greece, a ‘voluntary’ exit from the Eurozone would have been a high-risk move, which would not have insulated the Greek economy vis-à-vis the pressures of global markets, as assumed by proponents of nation-state economic sovereignty in a globalized economy. Rather, restoring Greece’s national currency could cause a social disaster on every front - economic, political and social - that would hurt the poorest and the most vulnerable citizens (i.e., through shortage in medical and pharmaceutical supplies, energy shortages, etc.). Despite justified leftwing skepticism regarding the conceit of a ‘unified Europe’, the option of exiting the Euro has not been translated into a credible political project, and has never achieved a considerable plausibility among Greek people. In any case, resisting being expelled from the Eurozone does not amount to an uncritical endorsement of the present order of things in the European construction. So in the context of a dramatically exacerbated balance of power, Syriza’s “defeat” that night was at the same time a victorious resistance to being kicked out without having been prepared for such forced exit – an exit that the Greek people, already exhausted by five years of austerity, was not prepared to handle. This is not to repudiate the need for preparing for alternatives to the strategy of refusing neoliberal politics without leaving the Eurozone. Such alternatives, however, must be radically different from nationalist configurations, and actively resistant to exacerbating structural inequalities and the further exposure of those who have borne the burden of austerity and welfare cuts to suffering. Syriza has succeeded, through its defeat, in provoking a rupture within the European structure. It has debunked the precedence of the economy over politics and inspired many among the peoples of Europe to imagine the unimaginable: another Europe, another democratic configuration of politics in Europe. But what seems entirely clear, however, is that, in traversing, and possibly partially displacing, the existing balance of forces, Syriza was brutally punished and politically enervated by a much stronger opponent. As Etienne Balibar, Sandro Mezzadra, and Frieder Otto Wolf rightly argue, the Syriza government “won the battle on the question of principle” even if it lost the war that ensued due to a crippling combination of forces.”[v] Syriza succeeded in politicizing the debt question and de-legitimizing austerity policies, but also put in question the normativity of the EU as a post-democratic neoliberal project. What is to be done now? Arguably, there is no possibility for Syriza to implement either the third memorandum or a default and exit strategy. It is now faced with an impossible dilemma: either fall from government or stay in power at the expense of its programmatic commitment to anti-austerity left politics. If it resists both the “parenthesis of the Left” scenario that various oligarchic forces and political elites (notably the coalition of New Democracy, PASOK, and Potami) have been aiming for and its transmutation into a party that administers austerity, it will have to devise a way out of the above dilemma. How can Syriza, as a party and as a movement, survive as an anti-austerity force of the Left? How can it hold on and promote egalitarian policy under the tutelage of the memorandum and the upward distribution of wealth that it imposes? Will it be able to mitigate the consequences of the ‘agreement’ for the working classes? A lot will depend on the way in which the Syriza-led coalition government will govern in response to such questions, or reformulate the questions through governing. Local and international elites want the Syriza government to be the briefest of “short left intervals”. Meanwhile, Syriza will have to continue passing laws that bear clear democratic left valence and signal its difference from its predecessors. It already has a remarkable record, considering the harsh pressure under which it has been placed, which includes a law that provided relief from humanitarian crisis by offering free food, electricity and public health access to those worst affected by the austerity policies; the citizenship law which granted nationality to all second-generation immigrants and first-generation immigrant children who have had five years of schooling in Greece; the closure of detention centers for arriving asylum seekers and non-regularized migrants; the law designed to democratize the penal law and to ensure the humane treatment of those incarcerated in the country’s prison system. Here arises another, even more daunting, question: what forces will be likely to capitalize on people’s disappointment, suffering, and loss of faith in democratic political processes in the event of Syriza’s disintegration? The current European leadership would be accountable for a possible rise in racism and far-right politics, and also the rise in technocratic post-political, anti-political forces, that would follow any collapse of the left in Greece. The question of how to respond to these challenges and how to mobilize our current impasse and defeat against Europe’s anti-democratic agents of coercion and extortion is a matter of collective intellect, resilience, and action. We know, however, that no answer can be formulated and enacted without the ethos of comradeship and the spirit of “intra-European internationalism” (Balibar, Mezzadra, Wolf). Even in moments of defeat and mourning. Especially in such moments. [i] Walter Benjamin, The Arcades Project, ed. Rolf Tiedemann, trans. Howard Eiland and Kevin McLaughlin. New York: Belknap Press, 2002 ([N10, 2], 474). [ii] Judith Butler, Undoing Gender. London and New York: Routledge, 2004. [iii] Catherine Malabou, The Future of Hegel: Plasticity, Temporality and Dialectic. New York: Routledge, 2004. [vi] Douglas Crimp, “Mourning and militancy”, October, vol. 51 (Winter, 1989), pp. 3-18. [vii] Jacques Derrida, Specters of Marx: The State of the Debt, the Work of Mourning and the New International, trans. Peggy Kamuf, Routledge: London and New York, 1994 [originally published in 1993].